Keep your vinyl fence clean all year long! 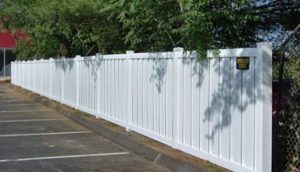 Do you want to revitalize your vinyl fence? Your best bet is to clean it! Generally speaking, vinyl fences are pretty easy to clean. If you want to increase to curb appeal of your property, take some time to clean your fence thoroughly! With that said, keep reading and discover a few tips for cleaning your vinyl fence. Plant matter is going to find its way onto your fence sooner or. If you don’t give it any attention, mother nature will overtake it in the blink of an eye. As a result, the appearance of your property suffer. Your fence serves as the backdrop to your landscape, so you want to keep it clean. Common examples of plant matter include moss and lichen. All you need to remove them is a solution of vinegar that is diluted with water. If you have vines growing on your fence, you may just need to give them a trim. It is very common for there to be water stains on vinyl fences. The good news is that they are very easy to remove. All you need is a mixture of vinegar and water to remove the stain. Water stains do not stand a chance to the acidity. Over the years, your vinyl fence is going to experience some scuff marks. In most cases, scuffs can easily be removed with soap and hot water. If you are not successful with that, you could then try using paint thinner and to buff them them out. One of the best tools for cleaning any fence is a pressure washer. Sometimes, elbow grease is not enough for removing water stains, dirt, plant matter, and other debris.